Migrant workers on a Beijing construction site, ILO in Asia and the Pacific/Flickr. With the sentencing of some prominent labour NGO activists in September 2016 to suspended prison terms, the precarious position of these organisations in Xi’s China became worldwide news. The arrests were preceded by a nation-wide crackdown on labour NGOs which started in 2012. The crackdown came as a surprise to many observers, as it took place at the time when a simplified registration procedure for NGOs was introduced and because these organisations had generally adhered to the politically correct line. Indeed, much has been written about the migrant worker/labour NGOs inability and disinterest in advancing social and political change. Yet, during the fieldwork conducted among migrant worker NGOs across China since 2011, I found that contrary to most views, most of these organisations promote wide-ranging social and political transformations. However, they often do so in an indirect and clandestine manner, which utilises, rather than necessarily subverts state-designated channels and language. I call this strategy ‘resistance through accommodation’. The social and political change which is promoted through this strategy does not involve a direct confrontation with the state, but rather aims to reshape various aspects of citizenship in China, which, as the examples below will show, often take a form of resistance to the prevalent order. It might seem at first counter-intuitive for NGOs to be able to perform acts of resistance through the government designed channels, but given the reciprocal nature of state-society relations in China, such strategy has actually proven more conducive to wider change than an open confrontation. In order to appreciate the transformative acts these organisations undertake, and the reason why they do so via the ‘resistance through accommodation’ strategy, it is necessary to briefly introduce these organisations. Migrant worker NGOs first emerged in China in the late 1990s, primarily in Guangdong and Beijing, and they grew in numbers and spread out across China in the late 2000s, under the more encouraging climate for NGOs. Their exact number is difficult to determine; my research indicates 50 active migrant worker-orientated NGOs across China, but there may be up to twice as many due to their unregistered status and high turnover of staff. Migrant worker NGOs differ from each other in terms of activities they undertake. Some of these organisations focus on community work, such as creating space for migrant workers in the city and educating their children. Some others, which are commonly labelled ‘labour NGOs’, undertake legal action work, labour mediation work or support for striking workers. However, many community-focused NGOs also emphasise issues of labour rights and labour consciousness equally to the legal action and movement-orientated ‘labour’ NGOs. Most of these organisations work in a ‘politically sensitive’ area of labour rights and workers’ empowerment. Because of that, the state often perceives them as a potential source of disruption to economic growth and a possible political threat due to the political alternative they may offer to disgruntled workers. With the introduction of the 2016 Charity Law and 2017 Foreign NGOs law, these organisations’ struggle for survival has faced additional challenges, as the new legislation makes it potentially illegal to maintain their foreign sources of funding, while restricting their access to domestic ones. So how can migrant worker NGOs, under such adverse circumstances, conduct any form of resistance? So far, the compliance with the state has been one such strategy, and until recently, it has been rather effective not just by allowing many organisations to secure some source of funding, but also in enabling them to promote a wider change. Their transformative impact on citizenship in China has been the key social and political change these NGOs have promoted, even though they mostly perform it through accommodative strategies. As I pointed out previously, their impact on citizenship can be mapped in relation to how they influence citizenship discourse, practice and status. 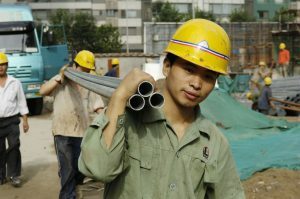 Those NGOs, which seek to transform the citizenship discourse mostly challenge the marginal position of migrant workers in urban China and their portrayal as ‘needing to be turned into citizens’ (shiminhua). They do it by emphasising migrant workers’ right to access city resources; by the promotion of migrant workers’ culture; and by bridging the gap between rural and urban through their cultural activities. They do so through seemingly ‘apolitical’ and accommodative forms of activism, such as the organisation of cultural and educational activities for both migrants and urban population and adoption of state-approved socialist language when talking about migrant workers. Sometimes they challenge citizenship discourse by overt acts of claiming space in the city, such as putting up a school for migrant worker children or resisting forced demolitions, but even when these acts are more overt, they continue to employ the state language as a form of justification. Some organisations seek to change the citizenship practices, which traditionally demand obedience and passivity from Chinese citizens. The very organisation of NGOs by migrant workers is an act of such change, as migrant workers take an active stance towards the problems they are subjected to. Some of these NGOs further promote such citizenship practices of public engagement among their constituency. An example of how they do so with the use of ‘resistance through accommodation’ strategies are the instances when NGOs train migrant workers in labour rights and coach them in court proceedings to create more rights-conscious citizens. Such activism has supported the state’s objective to channel labour conflict into legal dispute resolutions prior to 2012 (though the state has been withdrawing its support for rights defence weiquan activism ever since). Finally, some of these organisations seek to transform citizenship status, or a set of laws which define rights of citizenship, which currently limits citizens’ rights to participate in politics and migrant workers’ access to social rights in the cities. They struggle for change in rights of citizenship through networking with CCP officials, advocacy activities and sometimes petitioning with regards to both local regulations (for example related to court proceedings) and nation-wide laws (for example in relation to loopholes in country-wide labour laws). Again, some of these acts use the established accommodative channels (law being one of such channels), with others demanding a wider change in rights, particularly with regard to collective bargaining, which goes beyond the ‘resistance through accommodation’ strategy. While some of the above-mentioned ways in which these organisations undertake activism goes beyond the ‘politically acceptable’ line, particularly with regard to organising strikes and demands for independent unions, the majority of migrant worker NGOs prefer to adopt the state-prescribed and state-abiding channels and language to perform their activism. By the count of most research on resistance in China, such activism helps to maintain and reinforce the state/capital hegemony. However, it is important to note the incremental change that the above-mentioned acts carry for the citizenship formulation in China. While using the state-prescribed channels and language, these organisations seek to resist and ultimately transform the position and role of migrant workers in Chinese society and politics. This strategy might have more impact on social change long-term than much of the direct confrontation, which is traditionally perceived as ‘truly’ transformative. Gosia (Małgorzata) Jakimów is a Lecturer in Chinese Studies at University of Sheffield, School of East Asian Studies. Her research interests include critical citizenship studies, labour relations, labour NGOs and civil society in China as well as EU-China relations. This post is based on an academic article by M. Jakimów (2017) ‘Resistance through Accommodation: a citizenship approach to migrant worker NGOs’ published in Journal of Contemporary China 26 (108) and a book chapter entitled ‘Understanding Citizenship Beyond the Hukou System: The role of Migrant worker NGOs in transformation of citizenship in China’ (2015) published in Zhonghua Guo and Sujian Guo eds., Theorizing Chinese Citizenship: Challenges Facing Chinese Political Development. Lanham, Maryland: Lexington Books. Image Credit: CC by ILO in Asia and the Pacific/Flickr.